Micro Batch - Small Batches. Super Potency. Do It Right - Or Don't Do it At All. We Take Pride In Our Work. Yohimbine HCI is the standardized, concentrated version of the principal active alkaloid found in the herb Pausinystalia Yohimbe. 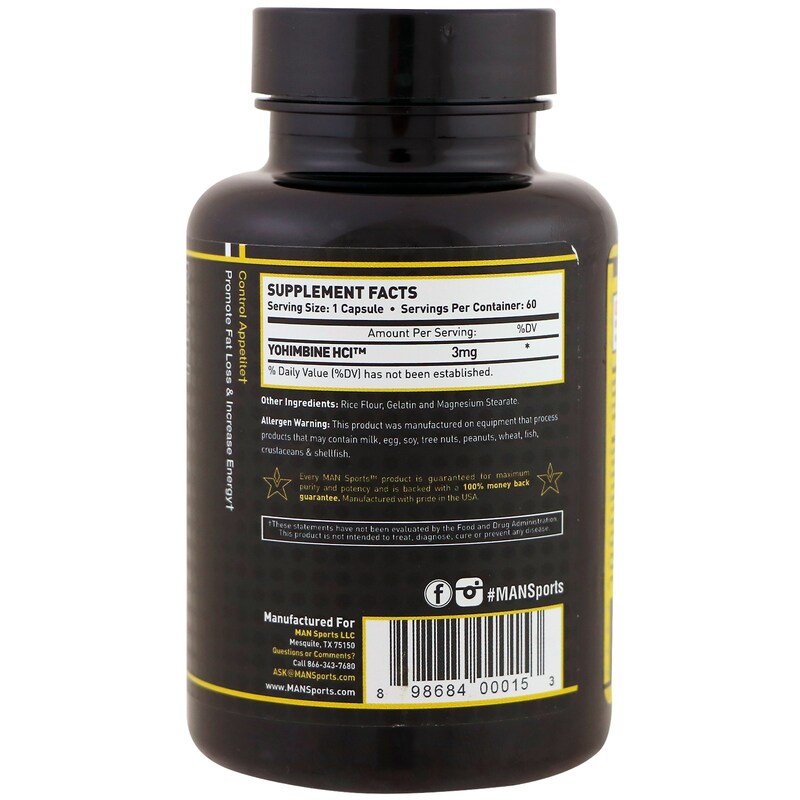 Don’t confuse MAN Sports real, high-grade Yohimbine HCI, with other less powerful, less purified or less concentrated forms of this herbal extract – which can contain up to 1,000 times less active alkaloid! Achieve that peeled physique by tapping into fat stores and unlocking your full thermogenic potential. As a dietary supplement, take 1 to 2 servings daily. For best results, combine with MAN Sports Lean Ph. 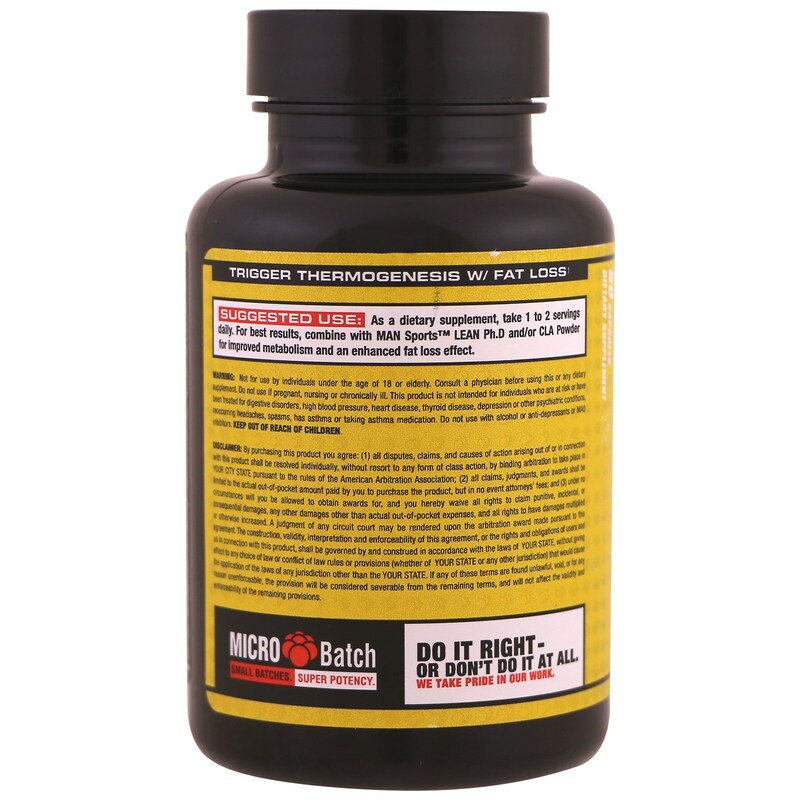 D. and/or CLA Powder for improved metabolism and an enhanced fat loss effect. Rice flour, gelatin and magnesium stearate. Not for use by individuals under the age of 18 or elderly. Consult a physician before using this or any dietary supplement. Do not use if pregnant, nursing or chronically ill. This product is not intended for individuals who are at risk or have been treated for digestive disorders, high blood pressure, heart disease, thyroid disease, depression or other psychiatric conditions, recurring headaches, spasms, has asthma or taking asthma medication. Do not use with alcohol or anti-depressants or MAO inhibitors. % Daily Value (%DV) has not been established.